The MobileStudio Pro with a choice of up to 16 GB RAM, Intel® CoreTM i5 or i7 processors and NVIDIA® Quadro® graphics has the power to run the full versions of leading professional creative software programs. 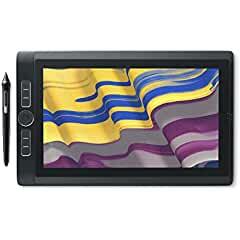 It overcomes the limitations of apps and combines creative freedom with maximum mobility. Featuring the Wacom Pro Pen 2 technology, the MobileStudio Pro offers the unique Wacom pen experience, high accuracy and precision, high-res 13" or 16" displays and last but not least, excellent graphics and color performance. "We designed the MobileStudio Pro particularly for creative professionals and how they work," Faik Karaoglu continues. "Since it first launched, it has changed the workflow of many professionals. Today, thanks to the team's continuous optimization efforts, we can announce a significant price drop that makes the Wacom MobileStudio Pro more affordable for students, young professionals and everyone who wants to create professionally on the go."